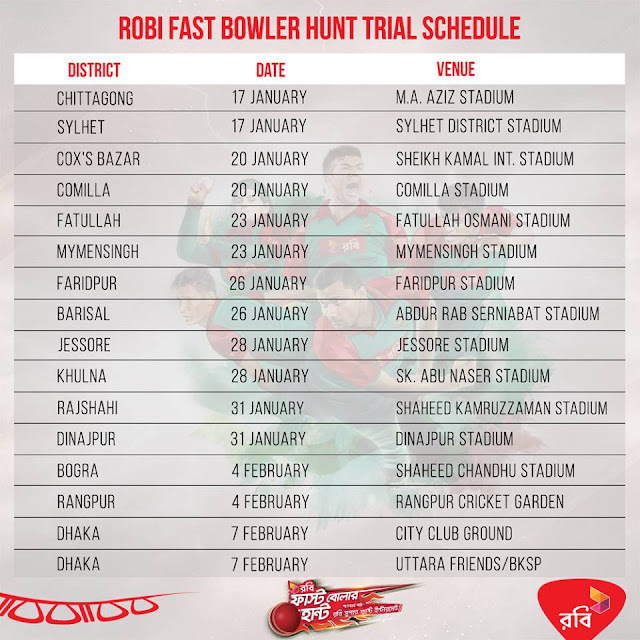 Robi Fast Bowler Hunt is a combined two month (January 1st 2016 - February 20th 2016) campaign organized by Robi and Bangladesh Cricket Board. The aim of the campaign is to acquire best male and female fast bowlers from all around Bangladesh. Trial phase or phase 1 will start from the 17th of January and will take place in 16 different locations. The participants will be judged based on their physical ability and skills. From the 16 regions 64 participants (3 male, 2 female) will be chosen to go to Dhaka for phase 2 and participate in the elimination rounds. After elimination round top 12 players (10 male, 2 female) will be declared winners and will have the opportunity to train under High Performance Unit.